In a stand mixer fitted with a paddle, mix the sugar and shortening/vegetable lard for 1 minute on low speed, until sandy. Add the egg yolks, then mix for 1 more minute on medium speed, scraping the sides of the bowl with a rubber spatula, until the mixture is light coloured and thick. Add the dry ingredients to the wet ingredients in three separate additions, alternating with sour cream, mixing until just combined on low speed and scraping the sides of the bowl each time. The dough will be sticky, like cookie/biscuit dough. Transfer the dough to a clean bowl and refrigerate, covered with plastic wrap/cling film, for 45 minutes (or up to 24 hours). Using a candy thermometer to measure the temperature, heat oil (at least 2 in/5 mm deep) in a deep fryer, large pot or high-sided frying pan to 325°F/165°C. Roll out the chilled dough on a generously floured counter or cutting board to 1/2 in/12 mm thick, or about 8 in/20 cm in diameter, flouring the top of the dough and the rolling pin as necessary to prevent sticking. Cut into as many doughnuts and holes as possible, dipping the cutter into flour before each cut. Fold and gently reroll the dough to make extra holes (working with floured hands makes the dough less sticky), and cut again. Shake any excess flour off the doughnuts before carefully adding them to the hot oil a few at a time, taking care not to crowd them. 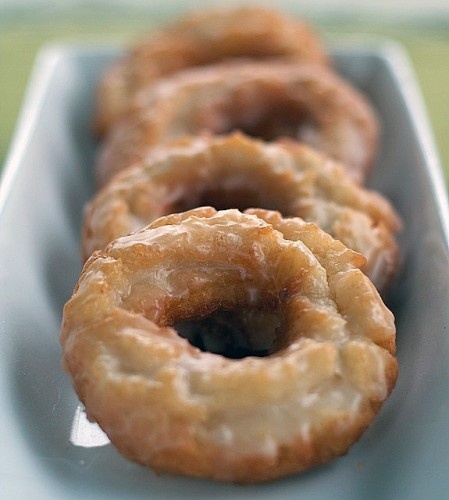 Once the doughnuts float, fry for 15 seconds, then gently flip them. Fry for 75 to 90 seconds, until golden brown and cracked, then flip and fry the first side again for 60 to 75 seconds, until golden brown. Transfer to a rack set over paper towels/absorbent paper. Place the confectioner’s/icing sugar, corn /golden syrup, salt, vanilla and hot water in a large mixing bowl or in the work bowl of a stand mixer fitted with a paddle attachment. Using a whisk, or with the machine on low, blend until the mixture is smooth and all of the sugar has been incorporated, scraping the sides of the bowl with a rubber spatula if necessary. If the glaze seems too thick, add more water, a teaspoon at a time. To glaze, dip one side of each hot doughnut into the warm glaze, and let dry for 10 to 15 seconds before serving.